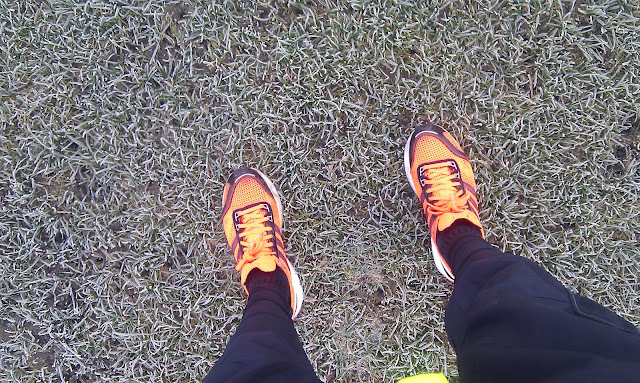 Sub-zero temperatures, frost and ice was probably not the ideal combination for my first cycle-commute (was it a commute?) to parkrun. I considered scrapping the cycle journey and changing the day's venue to one better reached by train, but in the end I stuck to the plan. The cycle route I decided to take from Westminster went pretty much straight along the Thames until I reached the Tower of London, at that point I picked up one of these blue super cycle lanes. 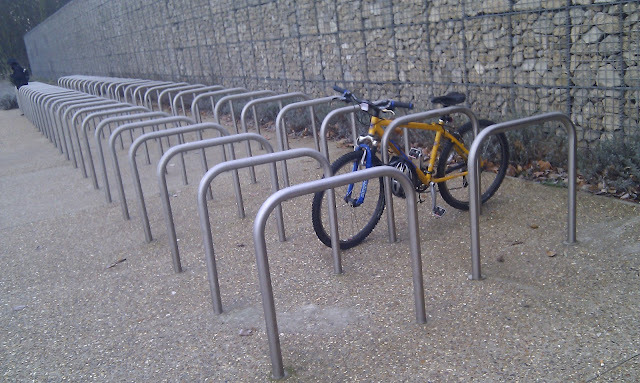 At the end of the cycle lane I was able to transfer to the Regents canal, which starts at Limehouse. 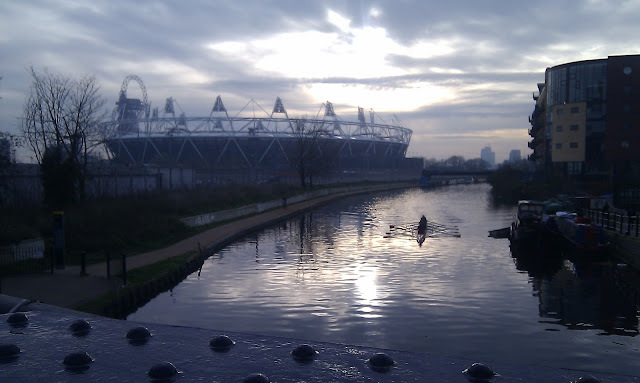 I rode North along the canal, and straight past the start line of Mile End parkrun. I then cut through Victoria park (complete with frozen lake) before joining another canal and passing the olympic/paralympic stadium. 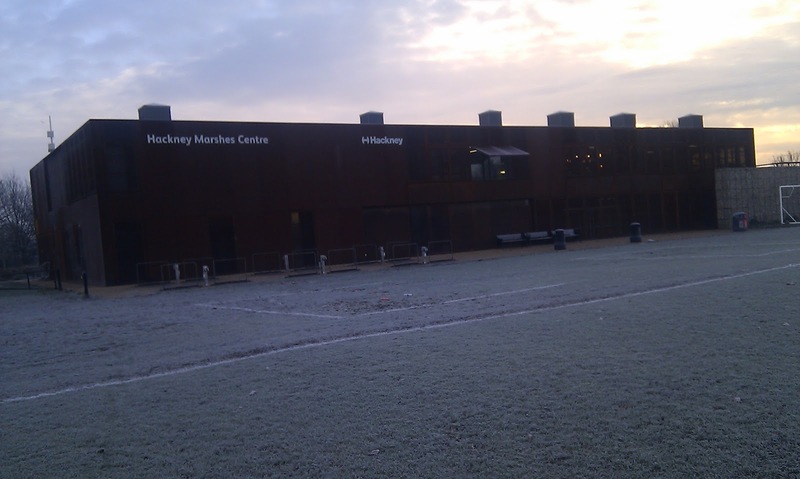 A few minutes later I had arrived at Hackney Marshes. The journey took a total of 55 minutes, my finger tips and toes were almost numb. It took a good 10 minutes of walking and jogging to get the blood circulating properly again. Hackney Marshes parkrun starts directly next to the Hackney Marshes Centre, it has a car park, about a gazillion cycle racks and sells refreshments. The course is almost entirely on tarmac and is flat. As the runners arrived it was very obvious that there is a real community here, all I could see was people chatting and smiling. I know this is the same for a lot of parkruns but for some reason it was even more apparent here. At 8.55 there was a small briefing for any first-timers, then we moved straight onto the main briefing. At 9am sharp we were let loose. 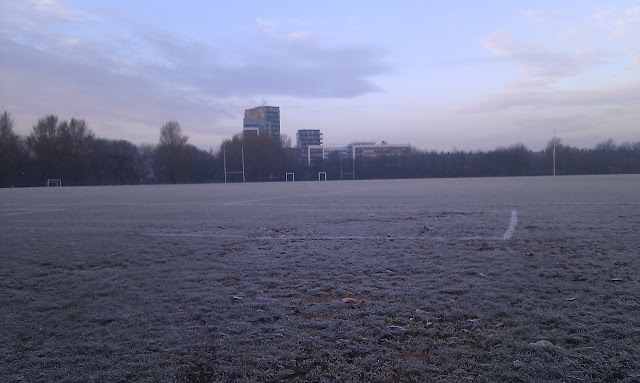 The grass was frosty with patches of ice so I started cautiously and after about 100 metres we joined the main path along the river lea. I had visited the course the previous weekend to check the cycle route so I was happy that I knew roughly where to go... until I reached a certain section where the tarmac path follows one route and a dirt track goes straight ahead. They both take you to the same point but as I was unsure I stayed on the tarmac path (the longer of the two routes). When I reached the 2.5km point there was a turn-around point, so I did just that. As I headed back along the path I noticed that everyone coming towards me was taking the dirt path, so I made a mental note to do that next time. I followed the path back along the river and finally back onto the grass and over the finish line. At first I forgot to take my finishing token (I blame it on the extreme effort making my brain forget simple things) but I was soon handed it. I had intended to hang around and have a tea with the rest of the parkrunners, but I kept thinking about the hour of cycling that I had in front of me and that I really wanted to get back home for breakfast, so I left straight away. On the way back home along the canal, I had an unexpected treat - a steam train crossed a bridge right in front of me, so I stopped and watched it go by. I wanted to take a photo for this blog post but couldn't get my phone out fast enough. I did, however, take a quick snap of the Olympic/Paralympic stadium.